Our next installment of Designer Spotlight features another British brand and designer (are ya seeing the theme yet?) creating clothes that bring smiles… Lazy Oaf. Lazy Oaf is an independent British street wear label founded by creative mastermind Gemma Shiel. Inspired by nostalgia and teenage rebellion, the brand doesn’t take anything too seriously. With crazy colors, talking hamburgers and quirky designs, Lazy Oaf escalates wacky and whimsical to whole new heights. She started off selling her tees on Spitalfields Market in London and has gradually turned Lazy Oaf into what it is today. 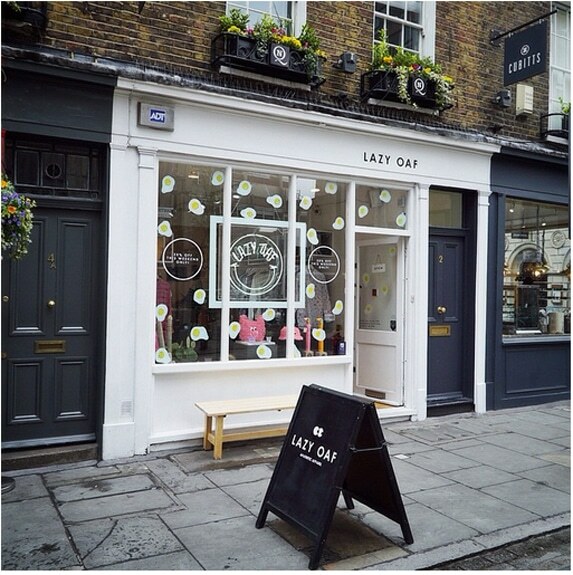 With a boutique, a HQ with six full-time staff members in Islington, dozens of worldwide stockists, and new products launching constantly, Gemma is a very busy lady who splits her time between designing collections and running the Oaf business. Lazy Oaf has become a trendsetter for the quirky and stylish aided by innovative collaborations and clever character licences, which were all born entirely from a personal desire for Batman printed leggings. Gemma admits the collaborations actually happened by accident. The first, launched in 2012, was a women and men’s Batman collection which “we did because I wanted some leggings with the Batman motif and didn’t think I’d get away with making them without permission,” states Shiel. The brand approached Warner Bros., and the collection came out just before The Dark Knight Rises. It was an instant hit. So much so, Lazy Oaf found themselves on the front of newspapers and re-running a lot of designs. The list of collaborations is impressive. From YouTube phenomena “Don’t Hug Me I’m Scared” and other independent brands (Poppy Lissiman, JuJu Shoes), to high-concept collaborations with the likes of DC Comics, Warner Brothers and Dreamworks (Batman, Looney Tunes, Garfield and Casper). 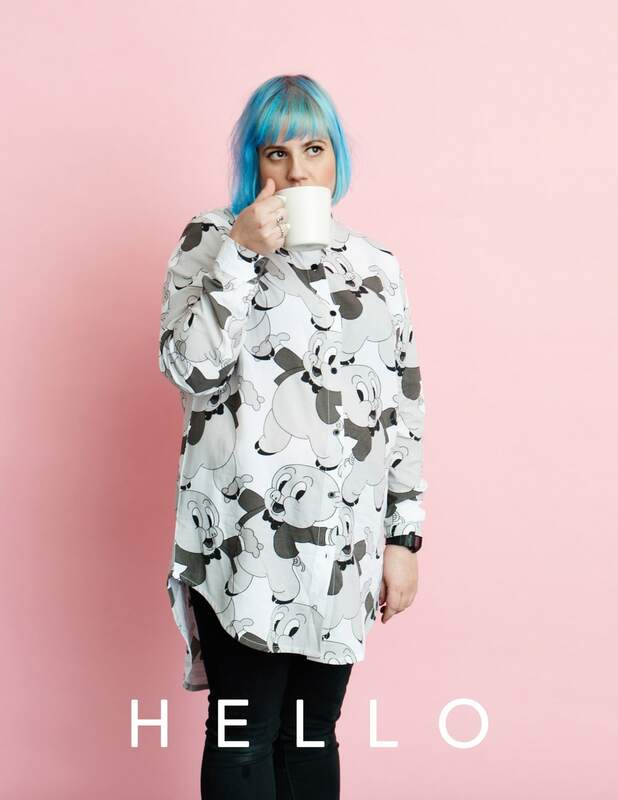 Where will Gemma take Lazy Oaf next? In 2016, Lazy Oaf celebrated its 15th birthday. To mark this milestone, a series of commemorative releases and special projects debuted in June 2016, the first of which was a re-release of the brand’s most popular archival designs, as voted by customers. However, Gemma also wanted to collaborate with a brand that is really personal to her. Since her style icon is Minnie Mouse, who better to collab with than Disney?! The cute cat is out of the bag 💙🎀Today we can reveal that part 1/3 of our #DisneyxLazyOaf collections will be with our favourite kitty Marie from Aristocats available from 20/10/16. The line dropped last autumn and featured some of our favorite characters reworked with a quirky, lazy twist. A frilly denim line inspired by Marie from The Aristocats. A white-and-black spotted faux fur coat that pays tribute to, of course, the 101 Dalmatians. Cinderella made an appearance with a pastel princess range, and there were even designs inspired by the one who started it all—Mickey Mouse—in the form of striped shirts, black jumpers, and varsity jackets. This one-of-a-kind brand reminds us that although, technically, we are almost grown-up, we don’t have to dress like it! Are you bold enough to rock Lazy Oaf? What other designers should we showcase in our spotlight? Let us know in the comments below!